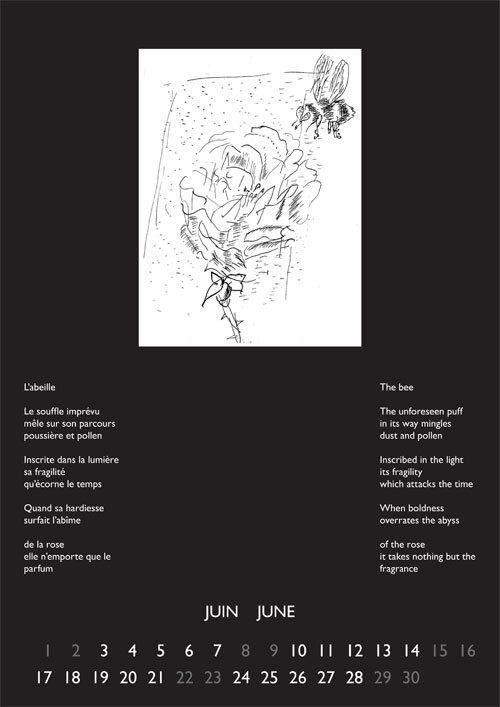 My friend and German translator Jörg W. Rademacher has collaborated with the French poet Yves Broussard from Marseille and artist Oliver Soskice to produce a bestiary-calendar for 2013. It’s in three languages: French-German the recto, French-English the verso with Oliver Soskice, an artist from Cambridge, doing pen drawings in black and white. A limited number have been published and some of these are available to purchase – see details below. Hors commerce, il a été tirée de cet ouvrage une édition numérotée de I à X. Not for sale are ten copies with Roman numerals I to X. Nicht zum Verkauf bestimmt sind römisch numerierte Exemplare I bis X.